When, in full view of family and friends, Charity Bloom's fiance leaves her stranded at the altar and takes off with her best friend, Charity is humiliated. How will this raven-haired beauty ever recover from losing both her betrothed and best friend on what was supposed to be the happiest day of her life? 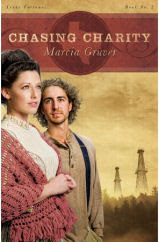 When tall, handsome roughneck Buddy Pierce finds oil on Charity's mama's land, he hopes to free the Blooms from their poverty-stricken state. But will Buddy find the real treasure lies above ground-in Charity herself? Ruing the day he left his fiancee for Emily Dane, Daniel Clark is determined to recapture Charity's affection. But can he remove the three things that stand in his way-a manipulative mama, a spurned lover, and the stranger at his ex-fiancee's side? When Daniel re-stakes his claim on Charity's heart, tongues wag and minds speculate amid schemes and scandals in Humble, Texas. Whom will she choose-the handsome roughneck or the deceitful rouge?